Munich has a wealth of superb museums, of which three stand out as particularly spectacular jewels in an inspiring cultural crown. The three are inextricably linked by their roots, mingled as they are with one another, with the Wittelsbach family collection, and, especially, with King Ludwig I of Bavaria (25 August 1786–29 February 1868). While the three museums ostensibly restrict their respective collections to specific time periods, there is certainly some understandable and justified overlap, so take the time frames as rough guides rather than hard-and-fast boundaries. 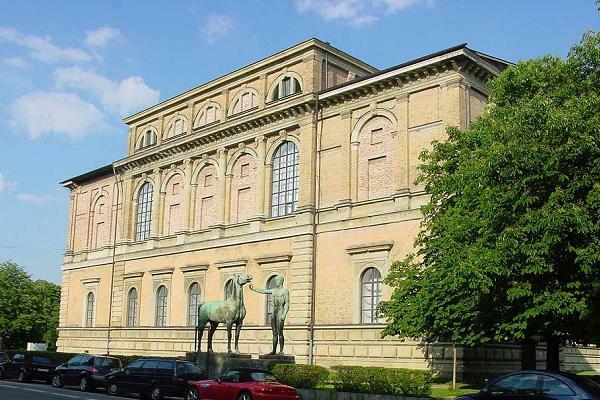 The first is the Alte Pinakothek museum, one of the foremost European repositories of the so-called old masters, i.e., painters whose careers developed and peaked before the 18th century, as well as those 18th-century painters whose oeuvres are rooted in pre-18th-century styles, e.g., Giovanni Battista Tiepolo, François Boucher, Francesco Guardi, Nicolas Lancret, Giovanni Antonio Canal, Jean-Baptiste-Siméon Chardin, Maurice Quentin de La Tour, and Claude Joseph Vernet. The Alte Pinakothek has thousands of paintings from the 13th through the 18th centuries (many of which it displays in a rotating schedule). German artists are certainly well represented, but there are significant, even enviable, examples of Dutch, Netherlandish, Flemish, Italian, French, and Spanish paintings. (The difference between Dutch and Netherlandish is too obscure and too complex for me to try to explain!) If you’re pressed for time, your short list of what to view at the Alte Pinakothek should include Rubens’s Last Judgment, one of the largest canvas paintings in the world. The second is the Neue Pinakothek museum. It focuses on paintings and sculptures from the 18th and 19th centuries (more than 3,000 altogether) and regularly displays at least 450 objets d’art. The collection comprises works that include German art of many movements, styles, and forms as well as robust English and several prestigious international holdings. Initially, the museum’s collection focused on Romanticism, paintings that usually included “. . . images of the transitoriness of human life and the premonition of death” (Painting and Sculpture in Europe, 1780–1880 by Fritz Novotny, Yale University Press, 2nd edition, 1971) and the Munich School (naturalistic style and dark chiaroscuro whose typical subjects are landscape, portraits, genre, still-life, and history painting). After the turn of the century, the collection received the Tschudi Contribution which added superb Impressionist and post-Impressionist works. The museum’s collection includes works by such titans of the art world as Francisco de Goya, Thomas Gainsborough, Friedrich Wilhelm von Schadow, Franz Xaver Winterhalter, Honoré Daumier, Lovis Corinth, Paul Cézanne, Vincent van Gogh, Gustav Klimt, Edvard Munch, Auguste Rodin, and Pablo Picasso. The third is the Pinakothek der Moderne museum. The Pinakothek der Moderne—locally known as “Dritte,” i.e., the third—specializes in 20th- and 21st-century art in four broad categories, each of which is presented as a museum, a so-called sub-museum, if you will, in its own right. The first is the museum’s “Collection of Modern Art” which includes art of all genres from classical modern through the post-war period to contemporary art, including Expressionism, Fauvism, Cubism, New Objectivity, Bauhaus, Surrealism, Abstract Expressionism, Pop Art, and Minimal Art. These movements include such artists as Henri Matisse, Paul Klee, Georges Braque, René Magritte, Wassily Kandinsky, Andy Warhol, Henry Moore, Willem de Kooning, as well as video, photo, and news media. The third, based in great part on the Technical University of Munich’s largesse, is the museum’s “Architectural Collection” comprising probably the most extensive collection of historical and current architectural drawings in Germany—again through an initial donation from King Ludwig I—and the works of such notables as Günther Behnisch, Gottfried Semper, François de Cuvilliés, Balthasar Neumann, and Le Corbusier whose photographs, drawings, blueprints and models anchor a collection that includes contemporary computer animations and photographs. The fourth is the museum’s so-called New Collection embracing the Munich International Design Museum, begun in 1925 and now includes more that 70,000 pieces, among which are objects of industrial design, graphic design, and the arts and crafts of so-called applied art, e.g., furniture, jewelry, appliances, motor vehicles—in other words, designs intended to capture the minds and hearts of consumers of pieces as mundane as a potato peeler to as grandiose as a skyscraper. These museums share a common web site. Contact the Alte Pinakothek, Barer Straße 27, 80333 München; telephone 49. (0)89.23805-216; the Neue Pinakothek, Barer Straße 29, 80799 München; telephone 49. (0)89.23805-195; and the Pinakothek der Moderne, Barer Straße 40, 80333 München; 49. (0)89.23805-360.